Our Ceiling Storage Rack is a "ready to bolt-in" storage solution for all years of the 80 series. It installs in the rear of your Land Cruiser above your line of sight in the rear view. The rack has an integrated bulkhead to keep large items in place while being aesthetically pleasing, extra strong, and allowing for mounting items to the underside. 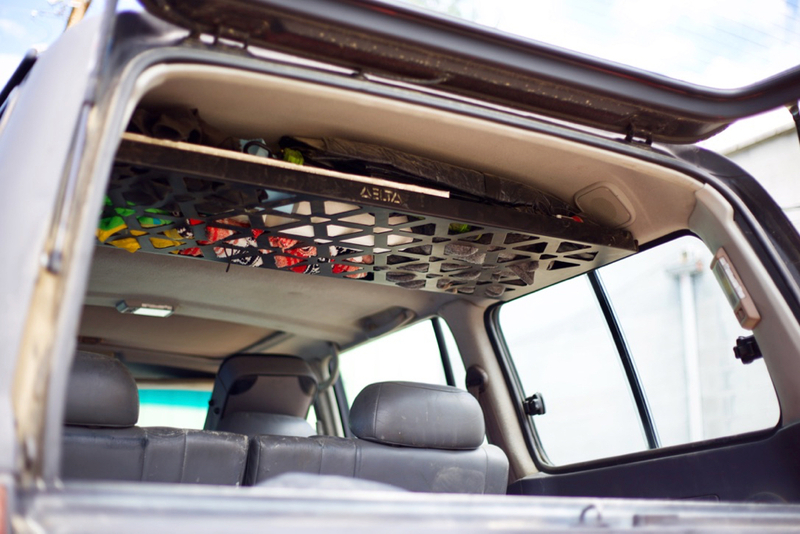 We are developing a lower bulkhead to keep pets and luggage secured in the rear compartment. The rack is rated for 50 lbs of softgoods storage. No hardware is included because you simply re-use the factory 3rd row overhead handle hardware (the 3rd row overhead handles must be removed to install the rack). Rack is only available in semi-gloss black powdercoat. You can see in the pictures below just how much stuff you can fit overhead, it's a lot!